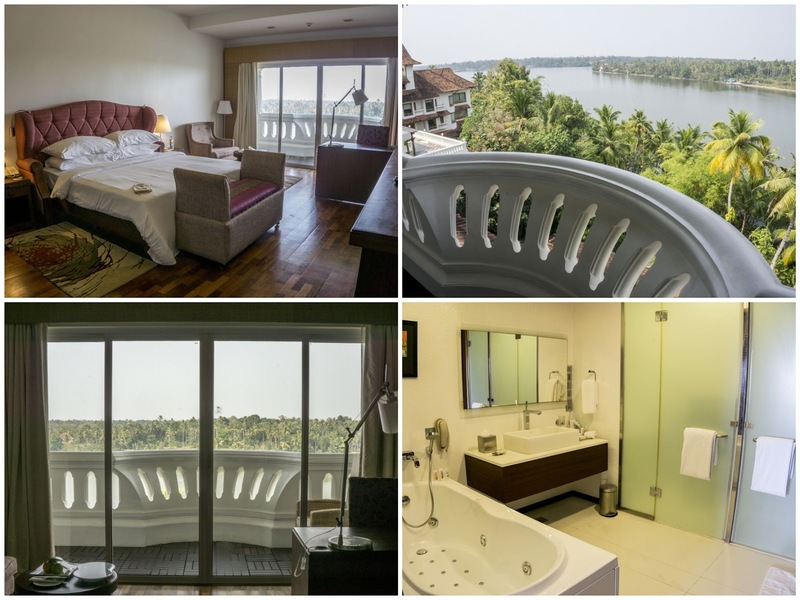 A three-year old luxury property spread over five sprawling acres, with 93 rooms including 9 suites and cottages, perched on the banks of the vast Ashtamundi Lake in ‘God’s own country’, also known as the state of Kerala. Kollam Junction is 4.5km away and is the nearest railway station. For domestic flights, Thiruvananthapuramis airport is 70km away and the hotel is 150km from Kochi. Ashtamundi Lake is Kerala’s second largest and deepest wetland , and the southern gateway to the famed Kerala backwaters. It wraps its eight branching tentacles around the hotel’s open lobby, wafting in gentle breezes and offering some special lakeside sunset views from the spa, rooms, gym and lobby that face it. The property is made up of two sections – the main Heritage Block and the adjoining Tower Block. The former is reminsicent of the architectural style of the 19th century Thevally Palace, with its vast and impressive lobby and generous use of dark wood on the staircases, exposed beams and furniture. The latter is more contempory, housing the business hall and the signature Ayurveda Spa on the sixth floor. The style as a whole is a complimentary blend of modern architecture and traditional Keralan art, with local artisans, architects, engineers and waterway specialists engaged in its design. It’s beautifully done and merges into the spectacular natural surroundings seamlessly. Each evening the hotel offers a complimentary sunset boat cruise for all guests, making the most of its unique location – calls are made to the rooms half an hour or so before as a reminder. In a similar vein, a cultural show is also hosted each evening in the hotel lobby. I’m not sure if it differs from day to day, but the evening we went down there was a small but perfectly formed young woman performing Bharata Natyam – a classic Indian dance with origins in the temples of Tamil Nadu – known for its grace, purity and tenderness. She was in full makeup and traditional dress, and it was wonderful to watch. 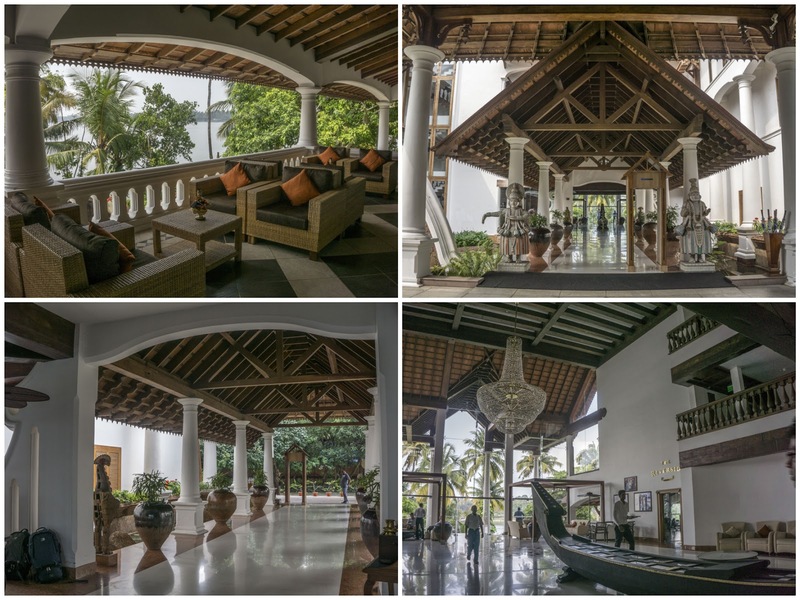 They can also organise a number of other complimentary activities to do on site – a list of which is provided at check-in – including rope climbing, fishing, saree tying, learning the Malayalam language, and watching cooking demonstrations from the restaurant chefs. Around the reception there are blown up photographs of the famous Indians that have stayed at the property – the likes of President Pratibha Patil and Bollywood superstar Shah Rukh Khan – posing with what I presume is the owner or head of the hotel or ITC chain as a whole. 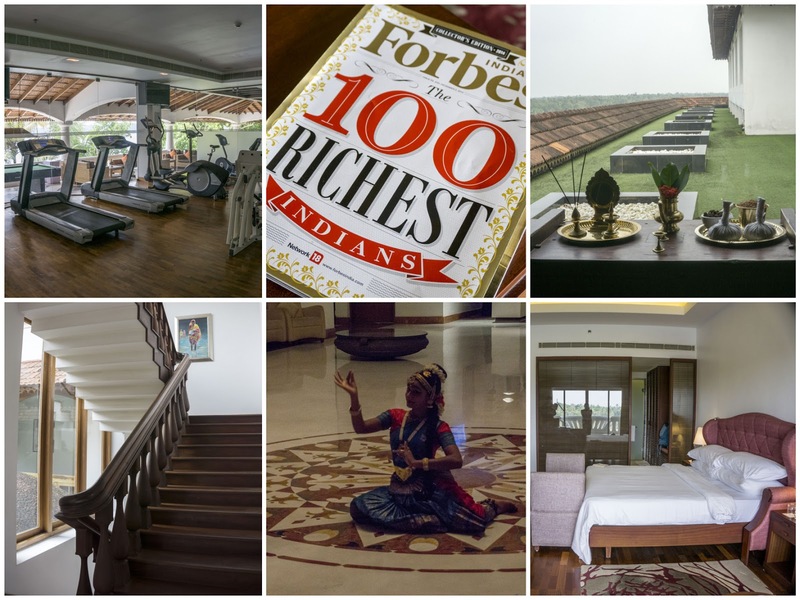 The rooms have the Forbes 100 Richest Indians magazine in them, which may be indicative of the clientèle and their target market. But from the people we saw, there were a mix of families, groups of friends, couples, tourists from India and those from further afield. As I have found to be quite common in good Indian hotels, the buffet breakfast included a ‘live station’ where a chef makes tasty fresh dosas or omelettes to order. The rest of the offering focussed on Indian food, with the usual southern suspects of idly (steamed rice patties), fried lentil donuts, sambar, chutneys, stuffed parathas and quite a few other breakfast dishes typical to the region. Alternatives were porridge, fruits, bread, chicken sausages, baked beans, fried potatoes and more . 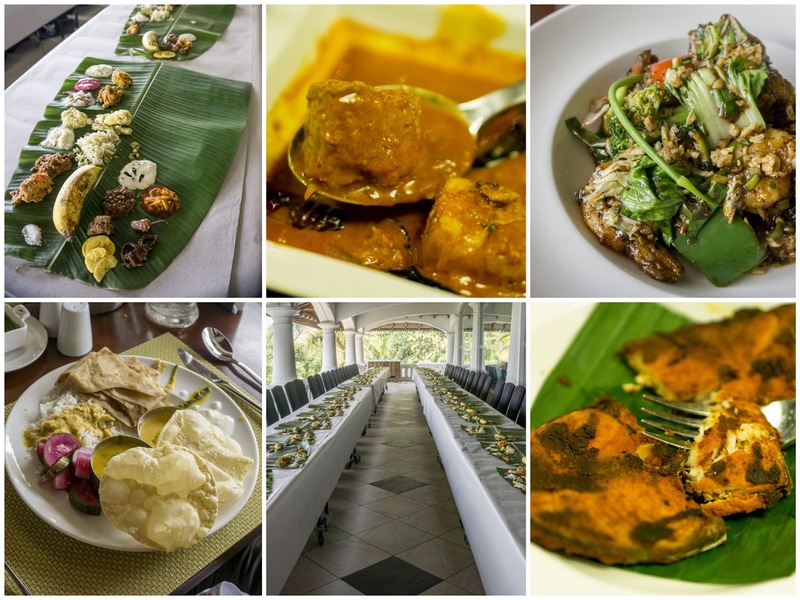 It’s held in the Lakeside Restaurant and if you choose to sit outside, the setting is picture perfect with the body of water twinkling under the strong Indian sun framed by the silhouetted fronds of palm trees. 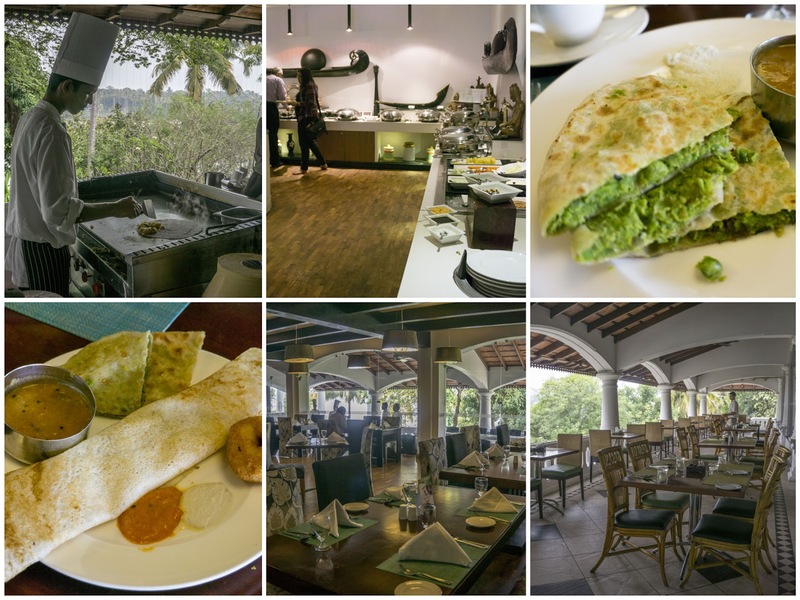 The all-day-dining Lakeside restaurant has a concise and well thought out international menu offering, along with a section for Kerala specialities and grilled Indian kebabs. One highlight from the local cuisine was the Allepey chemeen manga curry. It was prawns (chemeen) stewed in raw mango (manga), coconut and turmeric, and with shallots, green chillies, ginger, garlic, chilli powder, coriander powder, fenugreek, mustard seeds and curry leaves. Another was the Ashtamundi meen curry, essentially a Keralan fish curry, which will have different names depending on where you’re eating it in the state. It was cubes of fish (dictated by what’s caught that day – often karimeen which has black spots), simmered with shredded coconut, tamarind juice, chillies, garlic, ginger, coriander powder, turmeric, fenugreek, curry leaves, and with mustard seeds and shallots, and was very good indeed. International food offerings at hotels can often be disappointing. Whilst I would usually never order these on a short trip abroad (diving head first in the local cuisine is always my main priority), eating Indian food three times a day for almost three weeks had me desperately craving alternative flavours. One lunch time I ordered wok-tossed prawns with, garlic, Chinese greens and oyster sauce and it was so good, I ordered it again at dinner. The kebab meats were exceptionally soft and yielding, expertly spiced and a real pleasure to eat after having a lot of vegetarian food during our India tour so far. We happened to pass the restaurant when they were setting up to feed a large group for lunch. There were rows of banana leaves laden with all manner of southern thali dishes, waiting for the addition of piping hot rice and poppadoms. We’ve had a lot of thalis so far in India, but these looked particularly good. There is also Raanthal, a large boat that serves as a floating restaurant offering a unique option for private hire, be that for bigger groups hosting social events, parties or for an intimate and romantic dinner, as well as the Shanghai Club specialising in Chinese cuisine. This was a highlight of the stay, particularly within the restaurant, with special mention to Ashvin. His grasp of English was spot on meaning he understood any unusual requests the first time round, without me having to repeat myself. He also remembered my preferences from previous visits; it felt as though he was reading my mind before I was about to ask for something. Courteous, efficient and with a great mannerism and attitude, it was a pleasure being served by him and we always looked out for him each time we visited the restaurant. Reception staff were also fantastic, with Preethi ensuring our 1am railway station transfer was booked, sending us off with very appreciated packed breakfasts for our first overnight train ride. Nice touches include in-room check-in for certain rooms, a fresh fruit platter on arrival (the pomegranate was gorgeous enjoyed by the pool) and they have a concierge service that’s even available on Twitter @ITCHotelsCares. Liked lots. 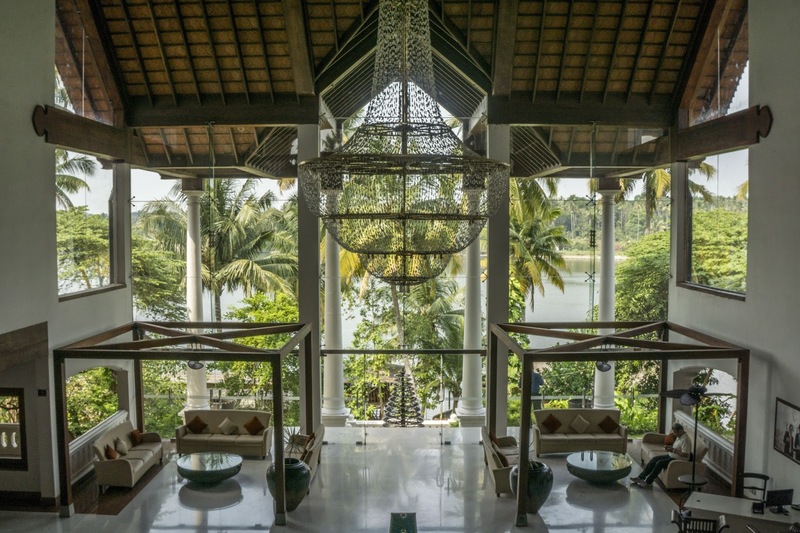 The Ayurveda spa has over 12 very nicely kitted out treatment rooms, each overlooking the picturesque lake, and offers a host of traditional and international treatments. The centre is ‘Green Leaf certified’ (the highest rating for Ayurveda facilities given by the government of Kerala) and offers both rejuvenating and curative treatments, as well as Ayurveda massages. 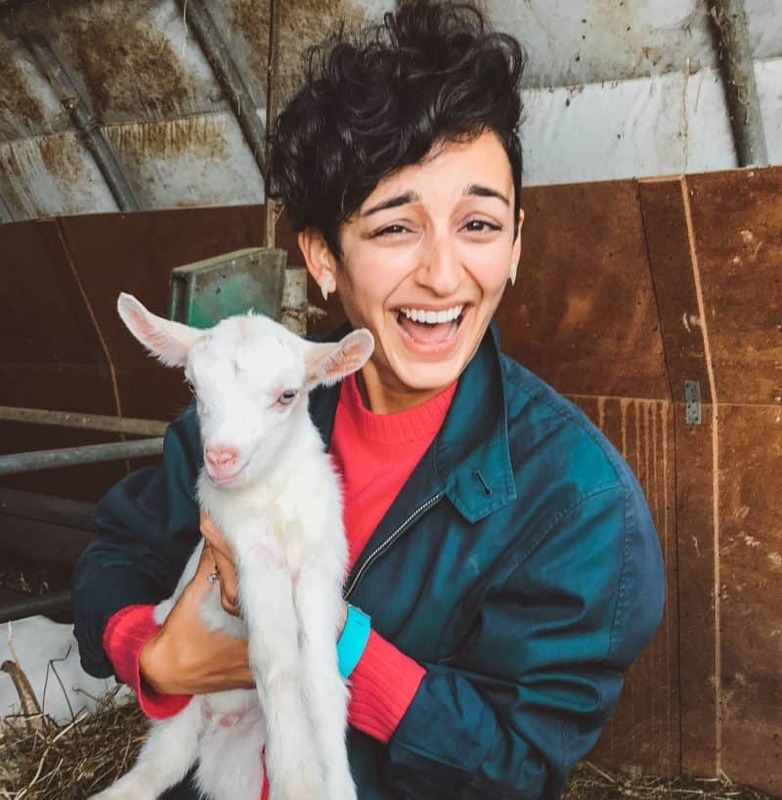 I indulged in an hour long Ayurveda facial which involved massaging with lemon and honey, a bracing exfoliation with a coarse paste, followed by a face mask. On leaving, I felt like I’d had a facelift – my skin was bright, taught and as clean as a whistle – fantastic. The service there was also wonderful. Liked less. The fitness centre has a view to compete with most gyms, but the air conditioning in it was not adequate. There are intermittent power cuts in the hotel – very brief and only lasting a couple of moments, you barely notice them. But this did mean the AC also cut out when I was using the gym and there was no one around to turn it back on. I did a 30 minute run in what must have been about 40C heat – it was toasty. Prices from around £46 a night for a studi to £300 for a suite, rooms inclusive of breakfast. Note: I stayed as a guest of this hotel.